South Indian weddings are known to dazzle with notable sentiments of stunning colors, gold jewelry, delicious food and customary lush flowers. Still, of all the splendor; the appearance of the bride on her wedding day is the most admired centerpiece in the midst of the mandap. 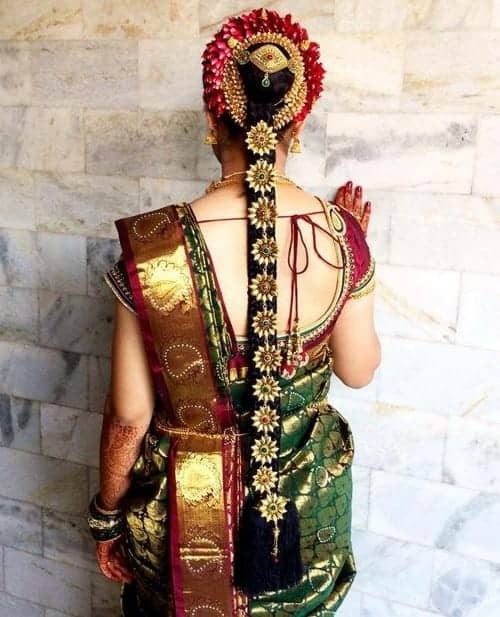 If you have long beautiful hair, get ready to explore some amazing long hairstyles for South Indian women you can try at your wedding. Three features captivate a bride’s breath-taking presence; her poise, her gown, and her hair. So, the way you style your lustrous tresses is just as important as your bridal gown. Here are our top choices of gorgeous long bridal hairstyles that will culminate in your wedding day. 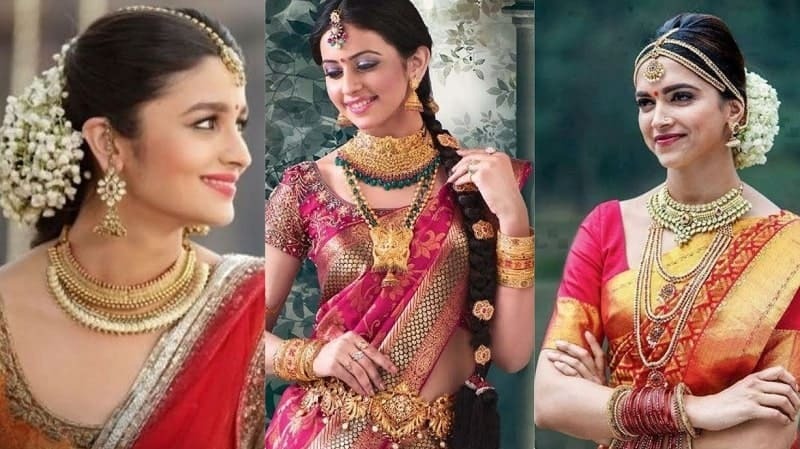 Here are some beautiful braided long hairstyles that will give a royal and elegant look to any south Indian bride. This bride has chosen to wrap her natural hair in a neat, simple bun, securely pinned with a garland. A lengthy hair extension is plaited and fastened to the bun, adorned with maang-tikka and other decorative hair accessories. The style compliments her outfit perfectly. 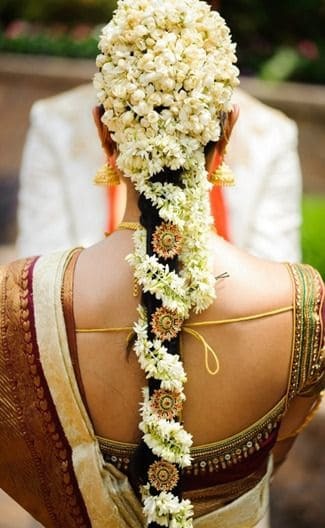 A beautiful South Indian wedding hairstyles for long-haired brides. The hair is parted in the middle to create a natural authenticity. Almost the entire covering zone is pinned with lavish flowers. A straight braid is made and additional flowers flow from the nape of the neck to the tip of the braid. The floral braided hairstyle for South Indian wedding look flows tenderly with the golden hues of the outfit. The hair is side swept and pinned in layers across the forehead line, leaving enough space for the maang-tikka. The remaining length of the hair can either be braided in a light messy fish plait or twisted into a long voluminous spiral. Remember to fasten your long hair with pins and adorn gracefully with your favorite roses. The color of the roses will complement the color of the bridle outfit. 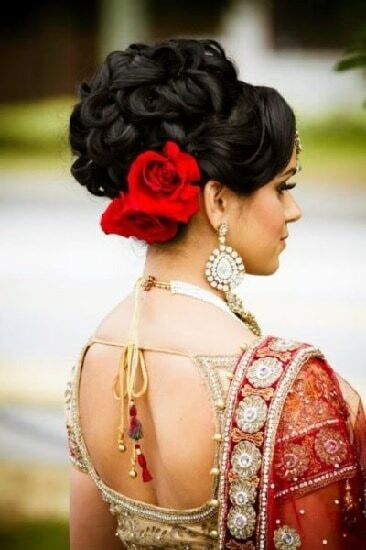 If you are a south Indian bride with long hair, consider going for a bun! 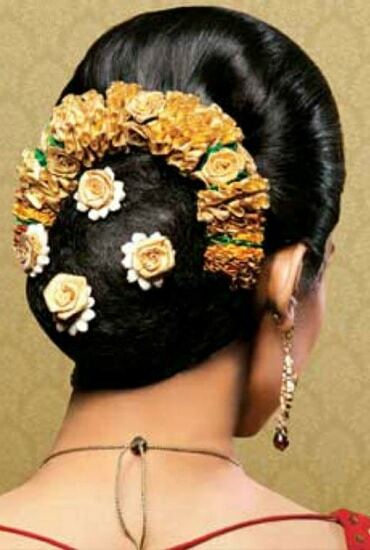 Following South Indian wedding hairstyles with graceful buns are enough to give a gorgeous look on your wedding day. If you’re wanting a South Indian wedding hairstyle that accentuates your features and is mysteriously elegant; opt for this compelling look. The hair is combed back tight; twisted or knotted into a bun; and adorned with complementing jewelry and flowers that match the bridal gown. An extra hair piece may be added to your own bun to create volume. If you want contemporary appeal with volume and texture; this is the bun that will get the attention. The hair is loosely swept to the side or back in a bouffant and gathered higher above the head in a messy but sophisticated look. Layers of hair are intertwined and fastened with faux hair, flowers or beads that can easily be harmonized with an Anarkali or lehenga. This stylish long wedding hairstyle will make your hair look simple yet elegant. The hair is brushed sleekly back in a high bouffant, and secured halfway down the covering area. The rest of the hair is tapered to form a bold, low bun at the nape of the brides’ neck. Very little adornments are needed for this already upmarket wedding hairstyle for long hair. Hopefully, you have enjoyed the above list of South Indian long hairstyles for wedding. Whether you prefer the ensemble of the royal traditional braid; or the elegance of the chic bun, our top style choices will certainly be captivating to all your guests; especially your gallant groom.